The School of Architecture and Planning has a rich history, dating from its founding in 1911 and continues a tradition dedicated to the professional education of those who will design, build, and conserve the built environment. 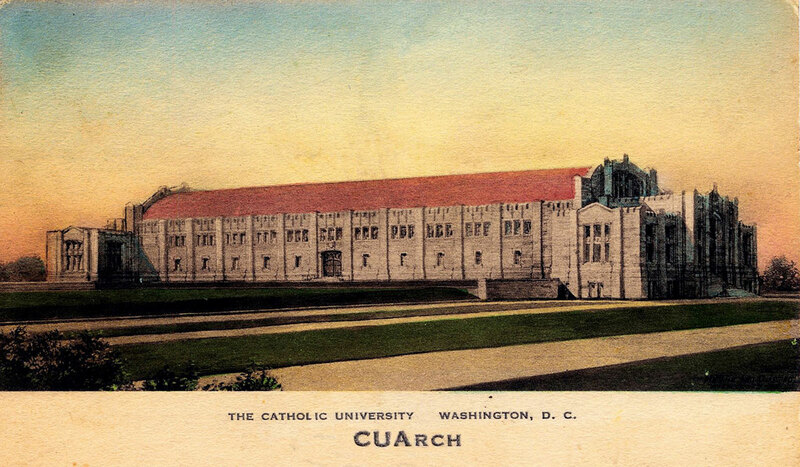 At the turn of the 20th century, gifted architect Frederick Vernon Murphy returned to Washington from the Ecole des Beaux-Arts in Paris and introduced himself to the fourth rector of The Catholic University of America, Rev. Thomas J. Shahan. In 1911, impressed with Murphy's drawings, Rector Shahan found unused attic space at McMahon Hall for a small but lofty Department of Architecture. Together, these two great friends planned the early campus, building Gibbons and Maloney Halls, the University Center, the John K. Mullen of Denver Memorial Library, and the old gymnasium, an immense structure that would play a pivotal role in the history and development of architecture at Catholic University. A faculty of one, Professor Murphy taught drawing, design, painting, history and construction to a small but devoted contingent of students. The department remained in the attic of McMahon Hall until after World War I, when returning veterans forced a growing department to move into the Social Center on the top floor of the old gymnasium. High above the basketball games, the lights were never out as inspired faculty and students captured two national Paris prizes, two American Academy in Rome prizes, four Fontainebleau prizes, and 14 Beaux Arts Institute of Design prizes. In 1928, Thomas H. Locraft won the Paris Prize. He subsequently became the second chair of the department in 1949, following Professor Murphy's retirement. World War II reduced the department from 50 to six students. However, in 1947, returning veterans swamped the one-room studio, forcing a second move to the remodeled Navy Barracks. Faculty and courses were greatly expanded and a new five-year degree program was introduced. Enrollment and programs continued to grow, and the search for larger and improved facilities continued. In 1961 the temporary Navy Barracks building was demolished and the department was moved to the third floor of Pangborn Hall. With further increases in enrollment requiring more space, increasingly weary faculty and students shifted back and forth between Pangborn, St. John's Hall, and the Archbishop's Chancery on Rhode Island Avenue, the latter two sites being slated for demolition. During the tenure of the third chair, Dr. Paul A. Goettelmann, from 1959 through the early 1970s, anti-Vietnam War and environmental concerns affected college campuses nationwide. During these critical times, Dr. Goettelmann served as a calming influence in his department. His leadership and talent as an educator convinced architecture alumnus and benefactor Benjamin T. Rome to establish the Patrick Cardinal O'Boyle Foreign Studies Program in 1970, and more recently to endow this important program in perpetuity. Dr. Goettelmann led the department through difficult years with wisdom and charm. Succeeding chairs, professors Forrest Wilson and Peter Blake, developed innovative programs such as the nationally known Summer Institute for Architecture and the four-year Master of Architecture program for students holding non-architectural degrees. Other programs included the four-year preprofessional degree, with subconcentrations in design, history, planning, and construction management. During the terms of the chairs Wilson and Blake, enrollment in architecture continued to increase. In 1984 Professors John Yanik and Walter Ramberg led their ARCH 200 “Fast Track” Graduate Students (now the M.Arch 3 Program) in a three-and-a-half week interior design exercise for the architecture program's design studios and exhibition in nine bays of the recently abandoned old Catholic University's gymnasium. Professors Yanik and Ramberg used raw material from this design exercise to develop a schematic design to accommodate the architecture program within the interior of the old gym. Professors Yanik and Ramberg, and Chairman Peter Blake presented their proposal to the provost and president for consideration. Because the gymnasium had been removed from the Master Plan and was likely to be demolished within five to ten years, the President was not in favor of recycling the old building. In the summer of 1986, Professor Yanik organized the construction of a demonstration project in several bays at the front of the gym. With a new chairman, Stanley Hallet, on board, a series of public events were held in the new space that excited students, alumni, and visitors. The success of the project led the university president, the Rev. William J. Byron, S.J., to begin discussions with Mr. Edward M. Crough, general contractor and alumnus of the School of Engineering, to consider the feasibility of providing the funds for converting the entire building for the Department of Architecture. The contract was signed on June 8, 1988, and construction completed in October, 1989. In honor of the newly renovated building’s major donor, the old gym was named the Edward M. Crough Center for Architectural Studies. With the assistance of the university's Office of Development, a major campaign to develop funds to renovate the old gymnasium and other support facilities was initiated. The Clarence Walton Media Center was developed and a Model Shop was installed for the construction of furniture and architectural models. The fully equipped Leo A. Daly, Jr., Computer Aided Design Laboratory was implemented through private support, primarily that of the office of his son, Leo A. Daly III, a Catholic University alumnus, as was his father. The dedication of the renovated former gymnasium as the Edward M. Crough Center for Architectural Studies on Oct. 19, 1989, brought the history of the architecture program at Catholic University full circle. The $4 million renovation provided a physical presence and sense of community appropriate to an academic unit that had long served the university. In October, 2009, with members of the Edward M. Crough family, alumni, faculty, students, and friends present, the School celebrated the twentieth anniversary of its spectacular renaissance at Catholic University. Professor Yanik was among those honored for his tireless efforts over the five-year period that led to the Edward M. Crough Center becoming a reality. On May 19, 1992, the Board of Trustees voted to separate the architecture and planning program from the School of Engineering and establish the School of Architecture and Planning, effective Sept. 1, 1992. Stanley Ira Hallet, FAIA, was appointed dean and James O'Hear III, RA, was made associate dean of the school. Professor Hallet served as dean until 1996, when he was succeeded by Gregory K. Hunt, FAIA. In keeping with the spirit of renovation that had earlier given an impressive new identity to the architecture program, a partial renovation of the lower floor of the Crough Center was initiated to provide new studio, shop, and classroom space for the school. Completed in the spring of 1997, this latest building project demonstrated yet again the university's continued commitment to providing the best facilities for the study of architecture on Catholic University's campus. Under the leadership of Dean Hunt, the school embarked on several new initiatives, including additional foreign study opportunities, extensive curriculum revisions, innovative design-build programs and explorations in applied digital design technology. In 2003, Randall Ott joined the School of Architecture and Planning as dean. Along with his administrative team, Dean Ott continues to advance the school in many ways, including the revision of the undergraduate curriculum, the creation of graduate concentrations, and the creation of the digital fabrication lab.